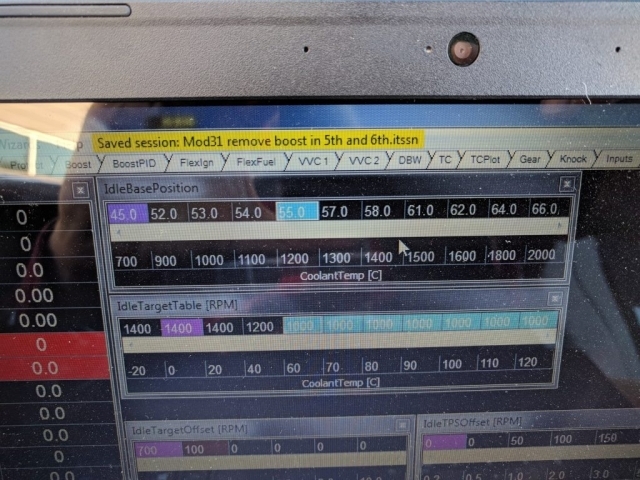 During initial cold-start, the car always stalls during the first attempt, but after that it’s fine. Though not a big deal, I feel the car needs to demonstrate that it has a tune better than just “okay”. To fix that means backing up a bit to explain. Anyway, now the car starts first try and idles properly even during initial cold-start in the morning, with “cold-start” being defined (in Southern California) as coolant being less than 20 C.
Another ECU change was to reduce boost in 5th and 6th gear – disappointing but necessary to keep from destroying the OEM gears. With 400+ ft-lbs of torque, the gears, used to seeing ~160 ft-lbs, just won’t last. Unfortunately it makes Midlana uncompetitive at Autoclub Speedway where top speed is 150-170 mph. That said, there’s another change, below, that may make that a moot point, maybe. The next issue was the persistent engine oil leak. I thought I had fixed it by applying sealant to what seemed to be the leaking fitting – nope. 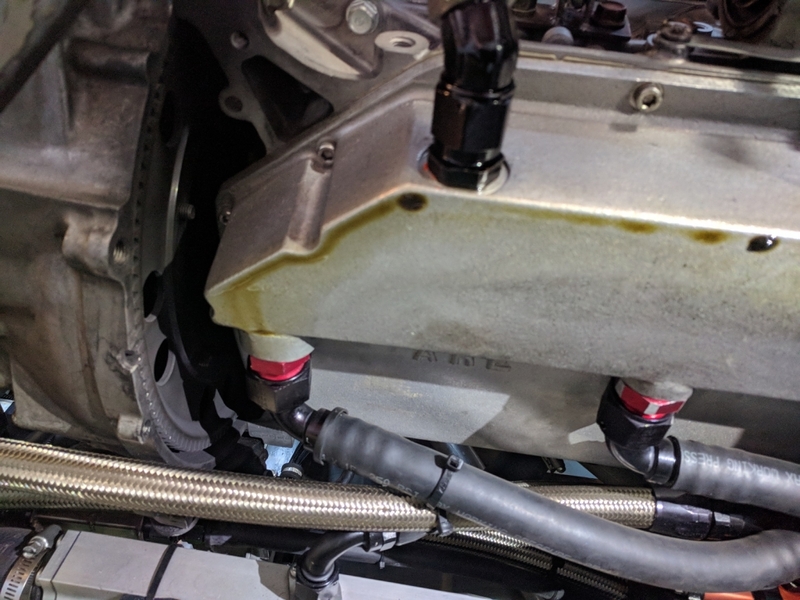 Now it looks like it’s a different fitting that’s leaking – one with another Stat-O Seal – not very impressed with them but it may be due to the machining on the pan. Anyway, the fitting was backed off enough to apply sealant and screwed back in. While in there, sealant was also applied along one edge of the front cover where it’s been weeping since new. The engine was started and warmed up, hopefully drawing sealant into the leak and adding heat to cure it. Now we wait and see, sort of like playing Whack-A-Mole. Another concern is that the benefit depends upon things that the driver has little or no control over: wind speed and direction, and disruptive airflow from other cars. My brother countered that wings aren’t all that different than brakes; if either fail it’s going to be a wild ride and it’s on the designer/builder/maintainer to keep an eye on them. I don’t completely agree with for the above reasons, but curiosity made me decide to give them a go. 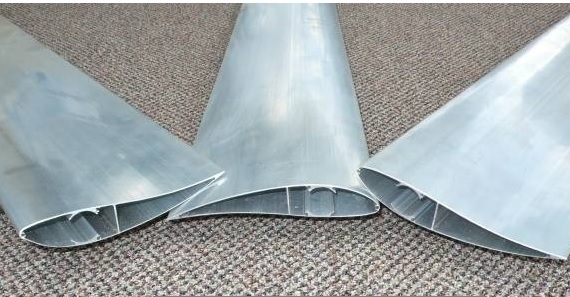 Because of my dislike of composite work (read: not having a proper workshop to do things right), I went with extruded aluminum wind generator blades from http://www.thebackshed.com/windmill/Trade/AlBladeOrders.asp. With a chord of only 6″ they’re not optimum, but a duel-element assembly should be enough to prove out the idea. As said before, we just do trackday events; there are no points, no championships, and no chance at F1-stardom. Being aluminum extrusions means fabrication will be about 100 times easier and faster than a foam-core layup. The visual change isn’t going to be subtle – the rear wing and endplates will take up the entire width of the car, 72″ (1.83 meter) wide. The only time they’ll be mounted is for track use; on the street they’re not only pointless, but pretentious and attract all the wrong kinds of attention. Lastly – tires. They’re ready to be replaced because time has flown by – they’re now 7.5 years old (read: hard)! The rears are really worn as well, bad for a cop to notice. 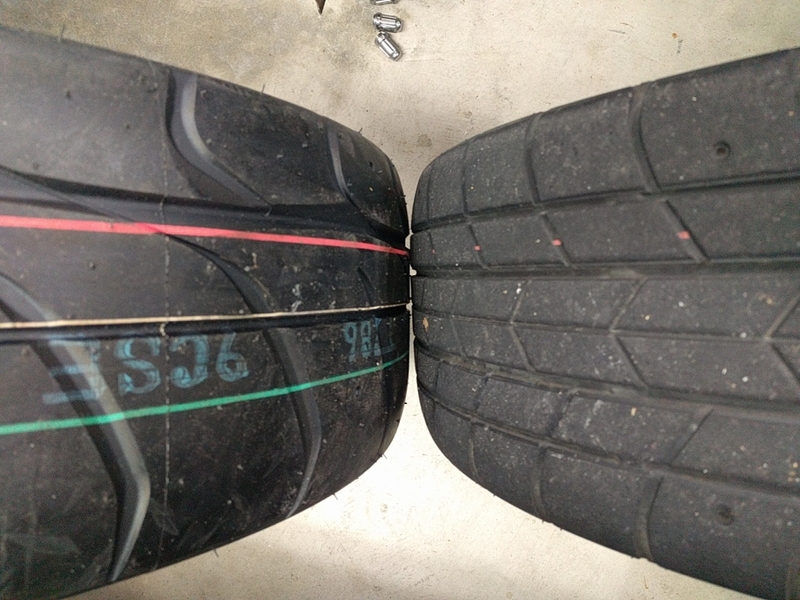 The good news is that they’re fairly evenly worn, meaning the camber gain curve is just right. Nitpicking, the center is slightly more worn, indicating that tire pressure could stand to be a bit lower. The thing is, with such a light car, going with lower pressure makes them more “squirmy” and they currently run around only 18 psi. That said, in general, for track use, more pressure means better traction, at least to a point. I chose to go with Nitto NT-01s this time. The sizes are the same*, with 205-40/17 in the front and 275-40/17 in the rear, but a different brand. My brother uses the same brand and is very happy with them because they remain sticky a really long time, so I thought I’d give them a go as well. It also removes one more variable of difference between our cars. Sort of tire related, Miata front hubs are one-piece units that aren’t intended to have the bearings removed (maybe they are but I’m not bothering). 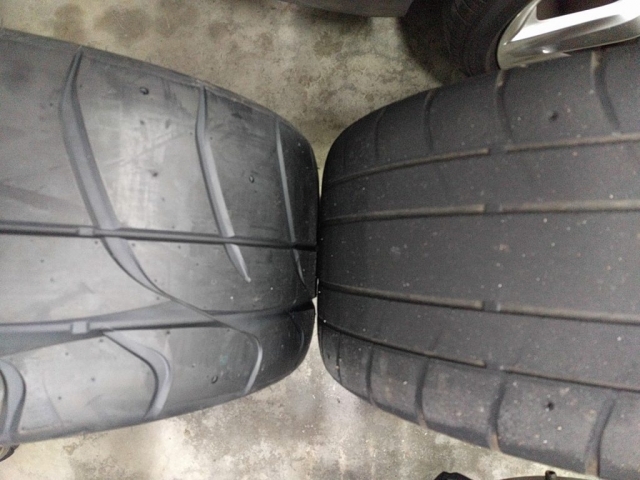 People who race Miatas complain about short bearing life, but since Midlana has about half the weight riding on them, I think they’ll be fine. That said, some play has developed in the front tires that at first I though was due to rod-end play, nope, it’s the bearings. Given that they’re used parts of unknown lineage, they may well just be worn out, so to “reset the clock”, they’re being replaced. This will better serve to see how long they’ll last on Midlana from new. *When magazines do tire tests, they typically pick some common size and do back-to-back track tests, then post the times. Whatever tire has the lowest time is deemed best, at least until the next tire comparison. There’s one thing many of the magazines leave out though, how a given tire “size” is more of a suggestion than fact. That is, a “255-40/17” tire from factory X is indeed 255 mm wide. Factory Y decides to one-up their competition, coming out with their own “255-40/17” tire which has a tread width of 265 mm. Factory Z, not to be outdone, released yet another “255-40/17”, this one with 270 mm tread width. Guess which one will most likely win? Tire comparisons based on a given size won’t necessarily find the best tire, exactly, yet the irony is that it doesn’t seem to matter. Class rules usually go by what’s printed on the side of the tire, not by what they really are. Anyway, these new “275mm” tires are about 6mm wider than my old “275mm” tires, making them 281 mm. Okay.